Book our 11 Nights 12 Days Best of Kenya and Tanzania Safari and explore the best tourist destinations in both Kenya and Tanzania. Contact us today. Day 2- Nairobi / Lake Nakuru National Park Breakfast at your hotel, meet your safari guide by 0800 hrs, board your safari vehicle and depart for Lake Nakuru with a brief photographic stop over at the Great Rift Valley Viewing point. After lunch, enjoy afternoon game drives around the park and along the shores of the alkaline Lake. The park is home to all the BIG 5 except Elephants, it’s a safe haven for White Rhinos and Rothschild Giraffes and hundreds of bird species, among them some Eurasian migrants and Lesser Flamingos may be spotted here. Dinner and overnight stay at Flamingo Hill Camp/similar. Day 3- Lake Nakuru / Masai Mara National Reserve After breakfast, check out and depart to the world famous Masai Mara, arriving at your lodge in time for lunch. Afternoon game drives from 1600 hrs, marking the beginning of the amazing Masai Mara game viewing experience. Dinner and overnight stay at Azure Mara Haven / similar. Day 4 and Day 5 – Masai Mara Early morning and late afternoon game drives (with an option for near full day) in search of the BIG 5; Lion, Buffalo, Elephant, Rhino, and Leopard and several other animals including Impalas, Gazelles, Wildebeests, Hyenas, Topis, Zebras, Giraffes and hundreds of bird species. Being a southern extension of Tanzania’s Serengeti, the annual Wildebeests Migration from Serengeti to Masai Mara also takes place here between July and October when millions of Wildebeests and Zebras closely trailed by the Big Cats cross the Mara River and roam the reserve’s plains insearch of greener pastures. Rest of the time at leisure in your lodge where you may also enjoy swimming.All meals and overnight stay at Azure Mara Haven /similar. Day 6- Masai Mara / Serengeti National Park Early breakfast at your lodge, check out by 0700 hrs and with picnic lunch transferred to Kenya / Tanzania border town of Isebania. Clear with immigrations, meet your Tanzanian safari guide and drive to Serengeti. You will arrive at your lodge late in the evening with en route game viewing. This enormous park supports every variety of animal imaginable – from large predators such as lion, leopard and cheetah to the smaller herbivores they prey on Overnight stay at Serengeti Sopa Lodge/similar. Day 7- Serengeti National Park Early morning and late afternoon game drives in the vast park with option for a near full day of game viewing. Serengeti, derived from the name “Siringet” which means endless plains in Masai Language hosts the great plains where the endless streams of wildebeest and zebra pour south towards Ngorongoro or north towards the Masai Mara during their annual migration. The park is home to the BIG 5 and other species including Hyenas, Cheetahs, Caracals, Serval Cats and several bovine species. It is also home to hundreds of bird species including vultures. Our game drives will cover the varied habitats and eco-systems of Serengeti. All meals and overnight stay at Serengeti Sopa Lodge/similar. Day 8- Serengeti / Ngorongoro Conservation Area After breakfast, depart for the Ngorongoro Conservation area with packed lunch. On arrival, you will immediately descend over 600 meters down the steep walls of the caldera for game drives and sightseeing along the crater floor. You will explore the forest areas that are inhabited by monkey and elephant, the lake area, where you may see the flamingos and the open savannah where the lions hunt for food. Picnic lunches will be served at the crater. The crater covers over 300 square kilometers of land and is the home of the rare black rhino, prides of lion, elephant, cheetah and great herds of buffalo, antelope and wildebeest. A UNESCO World Heritage Site, the crater has global importance for biodiversity conservation due to the presence of globally threatened species, the density of wildlife inhabiting the area, and the annual migration of wildebeest, zebra, gazelles and other animals into the northern plains. Extensive archaeological research has also yielded a long sequence of evidence of human evolution and human-environment dynamics, including early hominid footprints dating back 3.6 million years. Later in the evening, ascend to your lodge for check in with the rest of the evening at leisure. Dinner and overnight at Ngorongoro Farm House/similar. Day 9- Ngorongoro / Lake Manyara National Park Breakfast at the lodge, check out and depart to Lake Manyara area for check in at your lodge. After lunch, you will enjoy a short drive to the nearby Lake Manyara National Park where you will enjoy game drives. Lake Manyara National Park is situated spectacularly between the Great Rift Valley Escarpment and Lake Manyara. The most famous spectacle is the tree-climbing lions, which are occasionally seen along branches of Acacia trees. Lake Manyara National Park is also known for the flamingos that inhabit the lake. During the wet season they inhabit the edges of the lake in flocks of thousands but they are not so present during the dry season. More than 400 species of birds inhabit the park and many remain throughout the year. Dinner and overnight stay at Lake Manyara Serena Lodge/similar. Day 10- Lake Manyara / Arusha / Amboseli National Park Breakfast will be served from 0630 hrs. Depart by 0730 hrs and drive back to Arusha. Early Lunch will be served followed by transfer to the Namanga border where you will meet your Kenyan safari guide, change vehicle and proceed to Amboseli National Park with an evening game drive en route to your lodge, located at the foot of Mt. Kilimanjaro. Dinner and overnight Amboseli Sopa Lodge/similar. Day 11- Amboseli National Park Morning game drives at 0630 hrs and 1600 hrs respectively with the rest of the day relaxing at your lodge or enjoying a swim. Amboseli enjoys stunning views of Mt. Kilimanjaro and has several lakes and swamps that attract several wildlife and bird species. 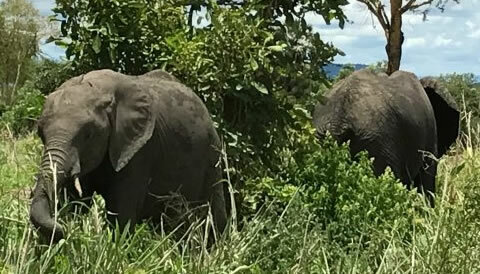 It is also world famous because of the Big Elephant and Buffalo herds that roam its savannah, scenic beauty among several other wildlife sightings. All meals and overnight stay at AmboseliSopa Lodge. Day 12- Amboseli / Nairobi / Depart Breakfast at your lodge. Check out by 0730 hrs and drive back to Nairobi. Optional lunch will be served at your lodge followed by transfer to the Jomo Kenyatta International Airport in time for your evening / night international departure flight, having discovered the best of Kenya and Tanzania with the destination experts. Return transfers from JKIA + meet and greet service. Private transport and game drives in a customized 4 x 4 safari vehicle with a pop-up roof and sliding windows for optimized game viewing and photography. Services of a professional, experienced English-speaking safari driver guide (French and Spanish speaking guides also available on request basis). Park entrance and conservancy fees to the listed parks and national reserves. All Activities and meals as listed in the itineraries. Quality binoculars and wildlife referral books provided in the safari vehicle (shared with safari guide and for use during game drives only). Enrolment on the AMREF Flying Doctor emergency medical evacuation cover (provided guests have valid travel insurance). Applicable Government taxes on tour services. *Additional sightseeing or deviation from the itinerary.